Property owners residing in unincorporated Lake County may be eligible to save an average of $281 a year on their flood insurance policies. Currently, there are more than 983 flood insurance policies in unincorporated Lake County. Through the Federal Emergency Management Agency’s (FEMA) Community Rating System (CRS) program, residents within unincorporated Lake County – who meet certain requirements – are eligible for up 20% savings on flood insurance premiums. This results in a potential total annual savings of $276,050 overall for residents across the county. Property owners should contact their flood insurance agent to obtain individual savings information. Since 2008, Lake County has participated in the CRS program and received favorable ratings, saving property owners thousands of dollars on their policies. Lake County is required to create an Annual Evaluation Report to maintain the favorable rating. Lake County works with homeowners annually to elevate structures above the regulatory floodplain elevation to prevent such structures from future flooding. Lake County works closely with citizens and coordinates with other agencies such as the Township Highway Commissioners and Lake County Stormwater Management Commission (SMC) to respond to drainage complaints affecting private properties. SMC’s Watershed Management Board (WMB) cost-share grant program helps fund local stormwater projects. The highest funding priority is flood damage prevention/mitigation but other project benefits are also included in funding decisions. Details of the Annual Evaluation Report can be found here. 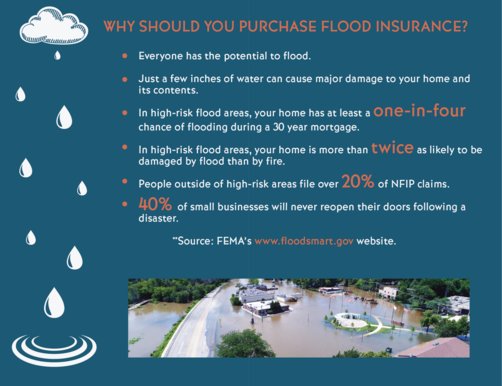 Contact your insurance agent for coverage information, pricing, and CRS flood insurance discount information. This notice applies to residents in the unincorporated areas of Lake County. If you live within a village or city, contact your municipality to see if they participate in the CRS program.